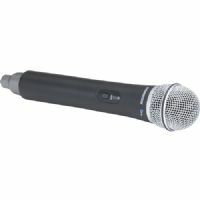 The CH88 Wireless Handheld Transmitter from Samson is a replacement handheld transmitter for the Concert 88 / 288 wireless systems. 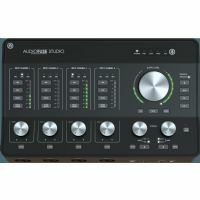 It can be used to capture audio for singers, business professionals, educators, and others. Useful accessory needed for mounting par-cans and U-shaped speaker brackets on speaker/lighting stands with 35mm diameter tubing. Features M10 bolt required to secure par-cans and U-shaped speaker brackets firmly in place. 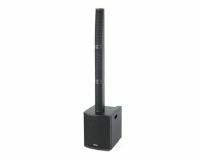 Looking for the perfect speaker for intimate gatherings or a backyard BBQ? The Expedition Escape+ delivers huge sound in a compact package. Don't be fooled by its modest size; the Expedition Express+ packs more than enough power to entertain small, medium and large groups of up to 100 people. 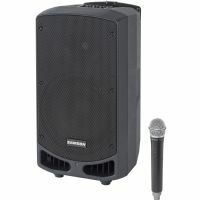 The Samson Resound VX8.1 is a portable column array system that delivers premium sound in a sleek, easy-to-transport package, perfect for mobile DJs, bands, singer-songwriters or anywhere high-quality sound reinforcement is needed. 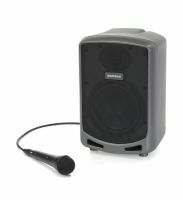 The XP312w-K Expedition Rechargeable Portable PA from Samson features a 12" Woofer and 1" tweeter with 300W of peak power, a rechargeable lithium-ion battery with 12 hours of battery life, a top-mounted 4-channel mixer with Bluetooth. 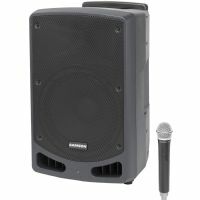 The XP310w-K Expedition Rechargeable Portable PA from Samson features a 10" woofer and 1" tweeter with 300W of peak power, a rechargeable lithium-ion battery with 12 hours of battery life, a top-mounted, 4-channel mixer with Bluetooth. 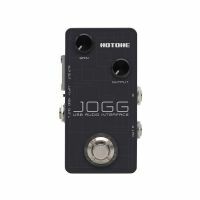 Professional USB audio interface in a mini-pedal-sized casing.